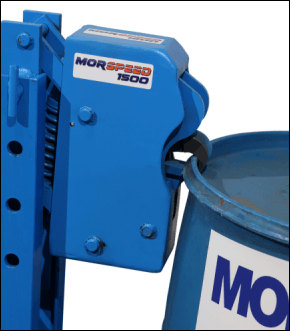 Vertical-Lift MORSPEEDTM Drum Stackers make it simple to lift, move and stack a heavy drum. The compact base and quality components of this Vertical-Lift drum handler make it easy to maneuver. Belted backrest pad equips the Vertical-Lift MORSPEEDTM Drum Stacker with a 12" (30.5 cm) wide cotton-based fabric belt. 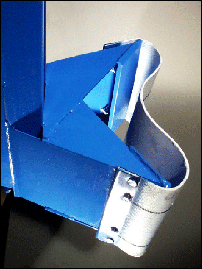 It contacts the sidewall of your drum to help protect it from being marred in handling. The belt is sold as a bolt-on kit. 512 45" (114 cm) Hand Pump 625 Lb. (283 kg) L74" x W48" x H83"
522 101" (257 cm) Hand Pump 825 Lb. (374 kg) L74" x W48" x H82"
2523-P Belted Backrest Kit 5 Lb. 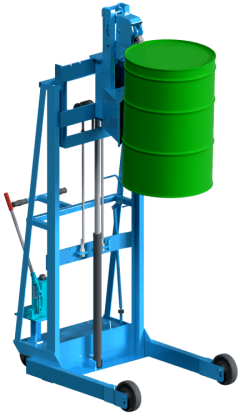 (2.3 kg) L17" x W10" x H10"
Vertical-Lift Drum Stackers. 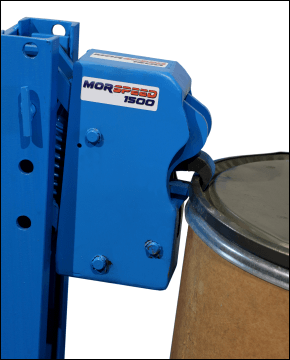 Ergonomic drum lifter on wheels for safety conscious drum stacking up to 101" (257 cm) high.